I’ll tell you, nothing gets one’s heart pounding more than a nostalgic theme song score playing during a film. Nothing is more iconic than John Williams’ music when it comes to Indiana Jones, unless you count the humor, the adventure, the whip, and the hat. Steven Spielberg even goes out of his way to show the silhouetted professor place said hat upon his head before we even catch a glimpse of the man himself. 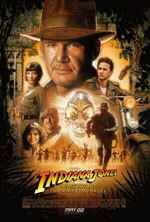 From the start, Indiana Jones and the Kingdom of the Crystal Skull transports you back to the 80’s when the series had its run. It is pretty much as though no one involved had missed a beat during the 19-year layoff from Jones’ “Last Crusade.” We are thrust into the action, unknowing how we got there and how he has been captured. None of it matters, though, the Russians need him to find an artifact and he complies until his moment of escape presents itself. Jones’ incorrigible demeanor and never say die attitude is still hiding behind the aged wrinkles, finding release every chance it gets right to the end of what turns out to be a faithful new installment to a classic series of cinema. What problems it has in trying to be a bit too extraordinary it more than makes up for in tone and overall sheer enjoyment. Harrison Ford is pretty astonishing here, showing that age means nothing when it comes to breathing life into a role that he made famous and vice versa. His delivery of cynical, stubborn wit coupled with the geeky wonder at discovering the answers to clues and puzzles hasn’t missed a single beat. Just look to the “dry sand” sequence and see what I mean…this is one college professor that truly dives into his work. All the prerequisites are included for his character to keep continuity. We receive mention of Henry Sr., (Sean Connery is sorely missed here, but hey, the first two films succeeded without him), and Marcus Brody, while also being treated to some physical humor involving none other than a mammoth snake—every hero needs a mortal fear. Callbacks abound, including a fantastic glimpse at the ever-elusive ark, and it doesn’t take long to get caught up in the action and really start pulling for these adventurers to come out victorious. 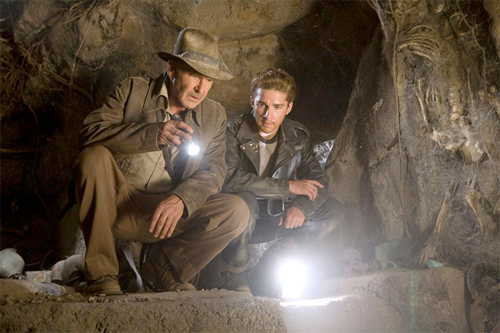 The story at hand includes much of the series’ trademark mysticism, leading all those involved on a quest to return the mysterious crystal skull to its rightful place, theoretically opening the doors to a treasure trove of gold. All the old stories about how the pyramids were created come into play with this quartz artifact, sculpted against the grain in a process that would destroy the whole if ever attempted by man. With its impossible magnetic pulse and draw of the mind to its eyes, no one quite knows what to make of it, except the fact that it must be returned. Of course, Indy and his band of misfits are on the journey to restore equilibrium and maybe uncover a mystery that the history books will never forget. Hot on his heels, though, are the Russians being led by the ruthless Irina Spalko, (an interesting Cate Blanchett), trekking across the world for the wealth hidden within the skull—knowledge and power the likes no gold could compare to. I really must thank Spielberg et al for stepping up to the plate and making this film, for the most part, in the style of the originals. Worries were definitely setting in from the badly blue-screened trailer and the CGI rodent popping up from the underground in the very first frame. However, the oldstyle font and glorious film grain of real live film stock brought me back to ease into the proceedings with faith it what could occur. All the action hijinks are here—car chases, crawling though cobwebbed tunnels, running against time down ancient architectural structures, and some good old fist fights complete with way too loud sound effects just a hair off timing-wise (vintage Jones). My favorite sequence is probably the motorcycle chase towards the beginning. Commencing with a brilliantly orchestrated soda shop brawl, continuing through town with screeching starts and stops, and finishing in the college library after a sliding entrance under tables, one couldn’t ask for a better payoff than a student asking his professor a question as he rises from the floor like this happens everyday. I give tons of credit for the bringing back of Karen Allen as Marion and even the inclusion of Shia LaBeouf’s Mutt—I don’t care what anyone says, the kid is good. And the addition of two favorites of mine, Ray Winstone and John Hurt can only help any film. Why am I just heaping praise right now? Oh, right, it’s because the hammer is about to drop. I have not read Frank Darabont’s rejected script, so who knows what he had up his sleeve, but this one falls apart completely at the end for me; I had a blast for the entire thing until the end climax. I can handle the supernatural and the questioning of alien life as a possible answer to the unanswerable questions in life, but David Koepp takes it too far. I laughed at the badly animated sword fight, I shook my head at the Tarzan sequence, but what happens at the end only made me think, why? Why did you have to go there when everything was so splendidly steeped in wonder while still grounded in reality? I guess you can’t have perfection bringing back a saga like Indiana Jones from the dead, but I applaud them for the attempt and almost getting it right. « It was a really hot October … Good Bye Lenin!